We've been eating a lot of pizza this summer here at NYC Tastes, I mean A LOT. More than just our usual Joe's Pizza order, we've been consuming great new pies all over the city and one of our favorites has been at Sottocasa. This tiny little spot in Harlem specializes in Neapolitan pizza, but not that limp, soupy pie that's associated with that style. This pizza is thicker, with a pillow soft exterior studded with bubbles of char from their wood burning oven, then topped with some of the freshest ingredients I've ever tasted on pizza. Like the Valdostana with tomato, prosciutto and sage finished with melted mozzarella and fontina cheese. Or the Tartufata, a white pie layered with homemade truffle spread and topped with mushroom, basil and prosciutto di parma. Mr. T loved the Tartufata while I fell head over heels for the saucy Valdostana. 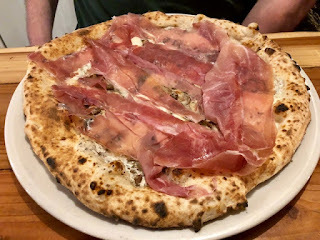 There were so many fantastic textures and flavors going on from the crispy bites of sage to the salty ribbons of prosciutto. 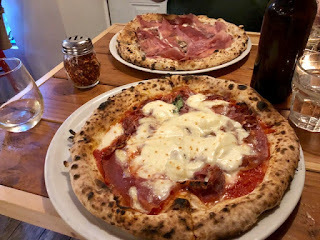 In addition to the wonderful pies Sottocasa had a long list of craft Italian beers and small but well appointed wine list that complemented the food to perfection.